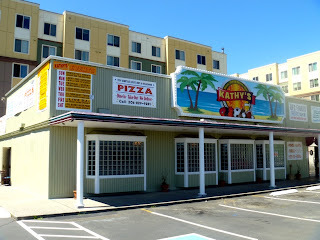 Update: Kathy's closed in late 2015. Kathy's is a large bar and restaurant in the former All Nations Soccer Bar space -- what was once Seattle's first Farrell's Ice Cream Parlor. The woman who waited on me was not Kathy but Michelle, whose brother is the owner and was married to Kathy, recently passed away. The family run homage to Kathy serves pretty standard pub or family diner style food to a crowd of neighborhood sports fans.